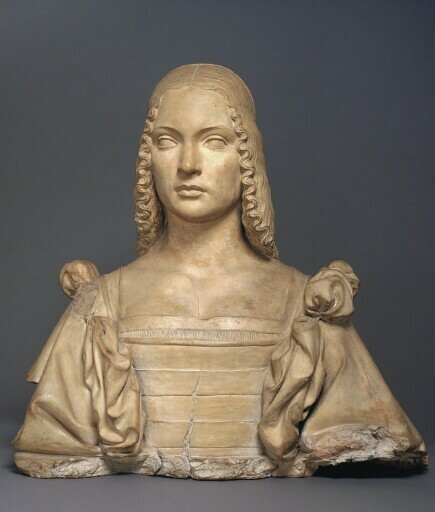 This rare terracotta portrait bust probably represents Isabella d’Este, Marchioness of Mantua. The most celebrated woman of her day, Isabella d’Este (1474–1539) cultivated one of the most illustrious courts in Renaissance Italy. She was a passionate patron who invited the most renowned artists in Italy to decorate her private quarters in the Ducal Palace. The identity of the figure rests in part on its correspondence to Leonardo da Vinci’s famous drawing of Isabella d’Este in profile (Musée du Louvre, Paris). It also bears comparison with a portrait medal of Isabella by Gian Cristoforo Romano, one of the leading sculptors of his time and an accomplished courtier, singer, poet, and antiquarian, who advised Isabella. As early as 1491, she commissioned him to make a marble portrait bust of her, although no such work by him is known. Isabella was not as attractive as she would have liked, and often complained that her portraits were unflattering. In much Renaissance female portraiture, including that of Isabella, a faithful likeness was less desirable than an idealized beauty that represented the sitter’s virtue. If the Kimbell bust indeed represents Isabella, it does so in a highly flattering way, presenting an ideal, classicized “likeness” that would have pleased the most discriminating of patrons. The bust was originally painted. As with almost all such terracottas, the colors were probably removed in the nineteenth century.